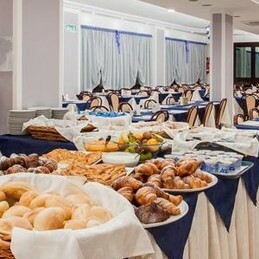 L'hotel delle Nazioni in Cesenatico open all year round, offers guests a range of services and amenities that make for a pleasant and relaxing stay for every type of vacationer. 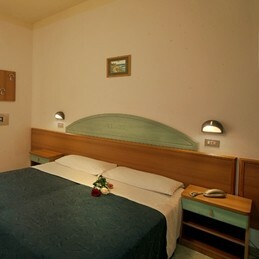 The Delle Nazioni is a hotel of Cesenatico All Inclusive, so you will have at your disposal all the facilities of the hotel, for a wonderful vacation to two steps from the sea. 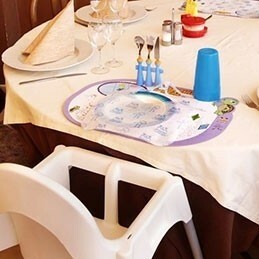 The Delle Nazioni hotel is suitable for families with children of all ages, couples and groups of friends; in addition, the hotel also has rooms suitable for disabled people. Soft drinks available at the bar of the hotel full time (water, orange juice, cola and tea. In the price is included the beach service at the private beach of the hotel Bagno Ferrara, and all other services for fun and relaxation. 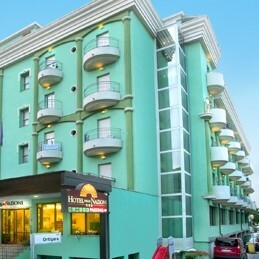 For example, you can use the free use of the hotel's wellness centre with mini swimming pool jacuzzi, sauna, emotional showers and Turkish bath. Also, during the summer, we also have the entrance to the ATLANTICA water park with swimming pool agreement (valid from the opening until the closing of the park). Open bar in the hotel all day, reserved for Costa Vacanze Card Club (you can request the card at the time of booking and will be delivered to the hotel with a credit of € 30). The open bar includes: coffee, non-alcoholic and bottled spirits, bottled wine, beer, canned drinks, soft drinks on tap (water, orange juice, cola and tea), Bimbo Fruit Drinks (peschita, bananito and fragolito). "I can say I had a wonderful holiday with my family, staff on the whole, extraordinary hospitality, food exquisite, the bathroom Ferrara always nice girls, thanks to Valentina, Chiara for sweetness against my two children and a special greeting the guys in the restaurant always available with all of us. " BATHROOM FERRARA well equipped clean bar xi children (games) snack xi children exi large bowls, exi young boys golf Beach Volleyball beautiful smile of LOREDANA E MARILISA SAID (SISA) that every day you are greeted with a pretty good day Smiling short and how to stay at home among friends "
"A few steps from the sea, the Hotel des Nations is like a second home, a fun and engaging staff, the service at meals, delicious and always on time, animation for young and old, including the bathroom Ferrara staff, always ready to have fun with our clients, parties on the beach and in the hotel every year entertains guests of all ages and not get bored "